Let’s start with a paper from Møller and CS Pedersen that got a fair amount of attention when it was published. The leading take-away from the paper in the popular and trade press was their finding that larger turbines (2.3-3.6MW) produce more low-frequency sound than smaller ones (below 2MW); specifically, the sound spectrum shifted downward by about a third of an octave. This has important implications moving forward, because of the push to increase turbine size in order to generate more electricity from each turbine; 3MW is becoming a common size in new wind farms. The increase in low frequency sound was moderate, just 1.5-3.2dB, but the authors remind us that at low frequencies, small dB differences are perceived as larger differences in loudness than at higher frequencies. And, the farther you go from the turbine, the more higher frequencies are dissipated while lower frequencies become the dominant component of the sound that remains. Infrasound and low-frequency sound are often not properly distinguished, and, as a peculiar consequence, low-frequency noise is frequently rejected as the cause of nuisances, just because infrasound can be discarded (usually rightfully). Infrasound is (still) often claimed inaudible, and sometimes even low-frequency noise, or it is reported that both can only be heard by especially sensitive people—which is all wrong. Weighting curves are misunderstood or (mis)used to give the impression of dramatically high or negligibly low levels. Sometimes, political utterances (from both sides) are disguised as scientific contributions. Infrasound is addressed only briefly in this paper, but their treatment provides a good foundation for understanding other papers. They use G-weightened sound levels in their consideration of infrasound, which, unlike C or A weighting, includes sounds below 10Hz, while accentuating the frequencies from 2-70Hz (though still adjusted in a way that lets one final dB number reflect a combined contribution of different frequencies’ sound levels). The human hearing threshold is 95-100 dBG, with anything below 85-90 dBG generally considered imperceptible. Their measurements of wind turbine sound at 90-525m were below 65 dBG; the highest measurements they found in the literature were 80 dBG at 360m, still below perceptible thresholds. The paper includes an unusually thorough survey of research into individual differences in hearing sensitivity at low frequencies (including studies suggesting that we respond to peak sound levels when there are large fluctuations, a precurser to the Bray/James study below which found peaks of over 90dBG), though the authors conclude that except for the possibility of a very few people with anatomical abnormalities in the hearing organs, the variation found to date is modest and so infrasound is unlikely to be a contributing factor to wind farm annoyance. But don’t rest easy just yet: they also stress that downwind propagation of low-frequency noise, and overall turbine noise, is often vastly underestimated using standard models. Atmospheric refraction – sound bouncing back down from air density boundaries overhead, and sometimes (especially with low frequencies) bouncing off the ground as well, so it’s channeled greater distances – can create much higher sound levels than we might expect at distances of beyond a few hundred meters. Sound just below the border of low frequency and infrasound (especially 8-16Hz) appears to dissipate much more slowly (“cylindrical” instead of “spherical” spreading), dropping by only 3dB with each doubling of distance, rather than 6dB as do most audible sounds. (Other papers included here, including the HGC/Ontario MOE report, also stress this factor, which the Ambrose/Rand field measurements confirm.) This means that at greater distances, the turbines noise that makes it that far will sound lower in frequency, and be louder than predicted by spherical spreading models. Their measurements of actual wind turbines also led to some quite remarkable results. They measured the sound power levels of 9 large turbines, then did two rounds of sound modeling. The first assumed simply spherical spreading, sound dropping 6dB for each doubling of distance. They measured how far they had to be from individual turbines in order for the sound to drop to 35dB, the level above which E Pedersen and Persson-Waye found annoyance begin to spike beyond 5-10% of the population, and also the level required in quiet areas in Sweden. Because the nine turbines had distinctly different initial (source) sound levels, the variation in distance was stunning, with this quiet sound level reached at distances ranging from 629m (2063ft) to 1227m (4024ft). Interestingly, when modeling small wind farms of 12 turbines, they found that sound levels of 44dB (Danish wind farm noise limit at homes) were reached at a very similar wide range of distances, 530m-1241m. But more striking still was the dramatic increase in setback distances necessary when they considered atmospheric conditions with a sound-reflecting layer. Here, they joined an emerging consensus in acoustics that propagation can be cylindrical beyond 200m, and found that homes would need to be anywhere from 1414m (4600ft) to 3482m (11,421ft / 2.16miles) in order for the sound to drop to 35dB. Again, they note that at these greater distances, as higher frequencies are absorbed and lower frequencies are less impeded, the sound becomes more dominated by lower frequencies, and that “Cylindrical propagation may thus explain case stories, where rumbling of wind turbines is claimed to be audible kilometers away.” This also helps explain the fact, noted in both the Hessler and Thorne papers below, that noise levels well above those predicted by noise modeling can be expected to occur with some regularity. If the noise from the investigated large turbines has an outdoor A-weighted sound pressure level of 44dB (the maximum of the Danish regulation for wind turbines), there is a risk that a substantial part of the residents will be annoyed by low-frequency noise even indoors. The Danish evening/night limit of 20dB for the A-weighted noise in the 10–160 Hz range, which applies to industrial noise (but not to wind turbine noise), will be exceeded somewhere in many living rooms at the neighbors that are near the 44dB outdoor limit. Problems are much reduced with an outdoor limit of 35dB. A literature survey paper by Karl Bolin, et al, Infrasound and low frequency noise from wind turbines: exposure and health effects, generally affirms the conventional wisdom that infrasound is of minimal concern, but also includes several somewhat cautionary notes. The paper begins by focusing on the mechanism that creates the low frequency and infrasound components of wind turbine noise, zeroing in on inflow turbulence as the primary contributor in the 10Hz to several hundred Hz range, covering audible low-frequency noise and some infrasound. A quick look at measured low-frequency and infrasound levels finds them, per usual, well below typical perceptual thresholds. The authors twice note that studies cited by Salt et al to suggest that infrasound is commonly at high enough levels – 60dBG – to trigger outer ear hair cell responses took place at very close range (20-100m) from turbines, much closer than residential sites. (Ed. note: however, see two studies below at residences where peaks of 60-90dBG were observed.) The section of the paper on annoyance levels notes that the widely-cited E Pedersen-Waye et al annoyance surveys all focused primarily on outdoor annoyance, while the same studies found indoor annoyance levels to be about half of those found outside at each noise level. Overall, these comparisons suggest that guidelines for wind turbine noise in the interval 35–40 dB would correspond to the proportion of annoyed persons comparable to the proportion annoyed by road traffic noise at a typical guideline value. The most comprehensive look at low frequency sound and infrasound from turbines to come out in recent months appeared in the journal Noise Control Engineering, and was written by Robert O’Neal and two colleagues at Epsilon Associates, a consulting firm. This paper includes an extensive literature survey, an indoor and outdoor field measurement program at a wind farm in Texas, and a comparison of the field measurements to several key noise control criteria. In short, they find that the low-frequency and infrasound components of the wind turbine sounds they measured meet all relevant standard criteria, including those from the International Standards Organization (ISO), American National Standard (ANSI), and UK and Japanese environmental agency guidance. Most of the findings are pretty straight-forward, as well as rather detailed, so I’ll refrain from recounting them here, and encourage you to check out the paper yourself. annoyance is minimal when the 16, 31.5 and 63 Hz octave band sound pressure levels are each less than 65 dB and there are no rapid fluctuations of the low frequency sounds. And, that according to UK standards, “A low frequency noise is considered steady if either L10 minus L90 (i.e., the difference between the loudest and quietest times) is greater than 5 dB or the rate of change of sound pressure level (Fast time weighting) is less than 10 dB per second” in the most extreme third-octave band. Ed. note: Bear these caveats in mind as we move to consideration of the faster time-averaged measurements reported below by Bray/James and Ambrose/Rand, both of which found significant variation of sound levels and rapid fluctuations in low frequencies. Infrasound is inaudible to even the most sensitive people 305 meters (1,000 feet) from these wind turbines (more than 20 dB below the median thresholds of hearing). Low frequency sound above 40 Hz may be audible depending on background sound levels. At present, this paper is the clearest summation of this widespread conventional wisdom. Well, dear reader, you’re doing well to be hanging in this long! Your diligence will be rewarded, as the next few papers move the discussion forward in several interesting directions. We’ll see some intriguing – and possibly troubling – sound measurements in very short time scales, an innovative approach to predicting annoyance reaction to noise, and a critique of typical noise measurement metrics. Alright, then, on we go! Probably the most provocative and ground-breaking paper among this batch of new research is the paper presented by Wade Bray and Rick James at Noise-Con 2011, the annual conference of the Institute of Noise Control Engineering (INCE). For years, Bray has stressed the need to assess sounds at time scales that reflect human auditory perception, and James has in recent years been on the forefront of investigating the sound of wind farms in locations where people have been especially bothered by the noise. In their recent paper and presentation, they worked together to assess the sound at a home in Ubly, Michigan 1500 feet from the nearest turbine (wind speeds were low, under 10mph, with temperatures of 17-22 degrees F, overcast skies, and no precipitation). Given the innovative approach this paper takes toward assessing noise levels, it’s especially difficult to summarize briefly; here I’ll mention the key concepts and findings, but I encourage you to read the full paper for a more complete context as to why the authors think this approach is an important adjunct to traditional assessment techniques. Ed. note: Because dBG weighting includes sound below 10Hz (unlike dBA or dBC weightings), some people tend to think this is a measure of primarily infrasound. Yet note that it actually includes a large chunk of audible low frequencies (up to 70Hz), while centering on that fuzzy transition between infrasound and low frequencies (10-30Hz). A central point of this Bray/James paper is that human perception responds to the peak sound levels, rather than averages (as also affirmed in Møller/CS Pedersen’s paper, above). 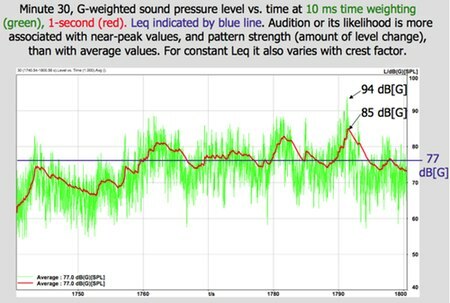 In addition, sounds that are highly variable in short time spans (called a “high crest factor”) are also more perceptible than sounds at a steady level or closely varying around the average, because human ears are very attuned to patterns in sound. 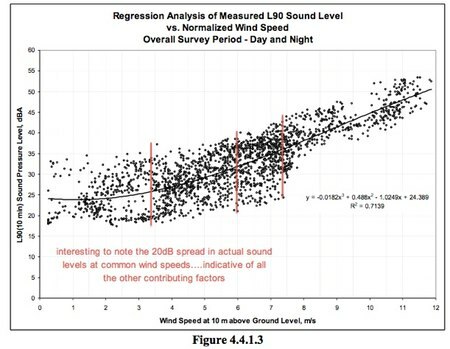 These two observations, combined with the fact that the measured peak levels approach much closer to the standard human perception curves than do the averages (which are typically used to assess likely perceptibility of low frequency wind farm noise), suggest to the authors that the low frequency and infrasonic components of wind turbine sound could be more readily perceptible than is normally assumed. (The standard human perception curves are derived by playing pure-tone sounds at carefully controlled dB levels; this method suggests a perceptual threshold for infrasound in the range of 95-100dBG). In addition to the very rapid pulses of sound over 90dBG (and much more often over 80dBG), which occur over a span of about 60ms, Bray and James reported several other variations in sound levels that they suggest may aggravate or increase the annoyance responses in nearby neighbors. They found tone-like higher sound levels at 30, 75, and 150Hz, pulsing a bit louder once per second (which corresponds to the “blade-pass rate,” the rhythm at which one of the three blades either passes the tower, or sweeps across the top of its rotation, through higher wind speeds). And, they noted several other “periodicities,” or fluctuations in sound level, including periods of 6-9 seconds of higher sound levels that came and went unpredictably (Ed. note: perhaps corresponding to periods of high inflow turbulence) and blade-pass rate sound peaks that varied in several frequency regions over time periods of less than a second, several seconds, and several minutes. This variability in the audible sound levels is likely a key reason that turbines trigger more annoyance than other noise sources. I’ll be very interested to see what other acousticians make of this new data, particularly the discovery of very rapid fluctuations and high peaks in the low frequency dB levels. It appears to my untrained reading that this is important new information, though I am far from conversant in the arcane details of short-time-period considerations of either human perception or sound levels. And while they didn’t find peak dBG levels above the classic perception curves (though they were close), these field measurements clearly confirm that infrasound is present at relatively high and very dynamic levels in wind farm noise. Time and further research will tell whether this is part of the reason why wind farm noise seems to trigger more annoyance than other sound sources at similarly moderate average dB levels. I should also note that this paper makes no claims about health effects being triggered by the infrasound levels; its focus is on the fine-time-scale structure and sound levels of the measured wind turbine noise and the relation of their findings to human perceptibility. Ed. note: While Hessler, below, suggests all infrasound recordings are contaminated by wind on the mic, Bray notes that his binaural mics provide a means to identify wind noise, which would be subtly different on each mic; and, the pulses of sound in synch with the blade-pass rate are clearly not wind noise. Another study just released by two longtime noise control engineers, Stephen Ambrose and Rob Rand, offers a close look at noise levels and health effects, while also providing some detailed sound data that complements the Bray/James work. This report is being circulated from Rand’s consultancy website, so unlike most of the others here, is not published in a peer reviewed journal or through an agency review process, but the authors are operating exactly in the area of their decades of expertise, did solicit pre-publication input, and the reporting is detailed enough to be worthy of full consideration. (Which is also reflected in a post-publication review by the Chair of the Acoustical Society of America’s Committee on Noise, who affirmed the validity of the acoustics-related methods and results.) The authors have also presented these results as an occupational health case study, in a paper which has been accepted for publication in The Bulletin of Science, Technology, and Society. The current report, titled the Bruce McPherson Infrasound and Low Frequency Noise Study, presents a short-term assessment of a particular location in Falmouth, Massachusetts where the resident (McPherson) was experiencing sleep disruption, headaches, and the like, located 1700 feet from a single operating turbine (a 2nd turbine nearby was shut down in high winds as a noise mitigation for neighbors). The authors were on-site for a bit under two days, and were surprised to experience the disorientation, difficulty in focusing, and sleep disruption reported by many Falmouth residents; they note that they are both prone to motion sickness, which may indicate some vestibular sensitivity. Since the authors had not experienced such reactions before in decades of noise control and monitoring work, they feel that their physical reactions give credence to the connection between health and focus/attention issues and exposure to the wind turbine’s sounds. Again, this paper contains much detail worth reading and evaluating for yourself, and I’ll just mention several key points. They note a clear correlation between their physical symptoms and both the wind speed and the power output of the turbines; a correlation with the dBG sound levels is suggestive as well, with ill effects more prominent with higher dBG levels, and at times with dBG pulsations (they felt fewer ill effects when dBG variation was random). As interesting as their fatigue, headaches, and lack of appetite may be – especially since they occurred without the stress, anxiety, or other personal responses to turbines that are commonly posited as the sources of reported health effects – this is clearly a very short period of study with just two (unplanned) subjects. While providing a solid indication of the value of further similarly targeted research, this study alone is far from definitive proof of a direct health and turbine noise link at this point. Near the end of their paper, however, the authors make an interesting observation. They note that the ramping-up onset of symptoms that they experienced, along with the more gradual dissipation of the symptoms after they left the site, both mimic a classic dose-response relationship; they suggest that the peak sound pressure events, which occurred on average once every 1.4 seconds, often over 60dBG (as reflected in their detailed measurements discussed below), can be considered the recurring “dose” that triggered their “response.” They mention a standard dose-response equation for considering cumulative effects that could be used to explore this idea further. Some of the actual sound measurements that were made are also particularly valuable. Their measurements found two tones with higher sound levels, at 22.9Hz and 129Hz; these are both low-frequency, not infrasound. The authors note that both tones exceeded the Outer Hair Cell stimulation threshold proposed by Alec Salt, both indoors and outdoors. They also point out that 22.9Hz lies at the high end of the range of the brain’s “beta waves,” which are associated with alertness, concentration, and active thinking. Interestingly, a closer analysis of the 22.9Hz tone shows a high variability in peak levels as also found by Bray and James; in this case, the average sound level was 50dB (unweighted dB I believe, but unspecified in the paper), with faster time sampling showing sound ranging from 15 to 60dB over the course of just a second, with a rapid peaks occurring every 40ms or so. And, at this location, 1700 feet from the turbine, dBG levels were often over 60dBG indoors, and consistently over 60dBG outdoors. (some critiques of Salt’s proposed 60dBG threshold for hair cell response to infrasound, including O’Neal, above, point out that Salt’s examples of turbines producing these levels were taken much closer to turbines, with the implication that 60dBG is unlikely at typical residential distances over 1200 feet or more). 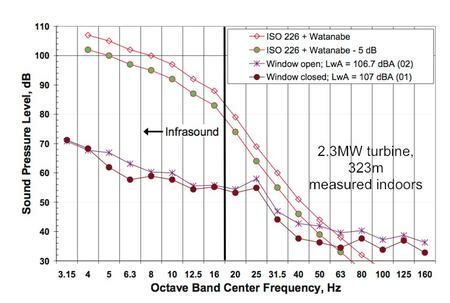 Finally, the authors made measurements at increasing distances from the turbine (268ft, 830ft, 1340ft, and 1700ft), and report that while the dBA decreased at a standard 6dBA for every doubling of distance (the assumption used in most sound modling), the unweighted sound levels (dBL) dropped at only 3dB per doubling distance, due to the slower dissipation of lower frequency components of the sound. And most interestingly, while at 1700 feet, the measured dBA was much lower indoors than out (43dBA outside, 21dBA inside), the unweighted sound level was actually higher inside than out (75dBL outside, 79dBL inside). This affirms many residents’ reports that the low frequency sound can be more noticeable, and more bothersome, inside than outside their homes. As the authors note: “Despite the apparent increase in energy indoors, the wind turbine was almost inaudible indoors. The house envelope blocked most of the frequency content above 10 Hz, and amplified the remaining low frequency pulsations….The acoustic pressure swung from positive (compressed) to negative (rarified) 0.2 Pa peak-to-peak.” As they note, residents often say they experience these low frequency pulsations as if they are living inside a drum. A recent addition to the pile of papers was David Hessler’s comprehensive guidelines for assessing sound emissions from proposed and completed wind farms, prepared for the Minnesota PUC and funded by the US DOE. A few things stand out here. First and foremost is the claim that all low-frequency and infrasound recorded near wind farms is simply flow noise of wind on microphones. Again, I’m not an acoustician or engineer, so can only make a few comments on that; you may want to read his logic yourself. He notes that tests of wind screens in quiet wind tunnels show high levels of LF and infrasonic noise (up to 70dB, unweighted at the lowest frequencies); he likewise presents some data showing near-identical dBC readings (averaging time not noted) at a residence surrounded by wind turbines and a location several miles from the wind farm, both of which vary with wind speed, and are seen by Hessler as further evidence that the dBC readings are nothing but wind noise. Ed. Note: I can’t help but note that the dBC levels reported by Hessler, as well as the dBG and dbL levels reported by Bray/James and Rand/Ambrose are well above the air-flow noise Hessler reports from the wind tunnel; this implies that there is additional low-frequency noise occurring above and beyond any microphone contamination noise. Also, much of the low-frequency and infrasonic sound measured at faster time scales (by Bray/James) show clear patterns in synch with the blade-pass rate, which would not be seen in air-flow noise on the mics. Finally, the problem of air flow on the mics can be bypassed by recording at times when wind is very low at the ground/recording level, and high at hub height. And, binaural systems (such as those used by Bray/James) allow a comparison of the two channels; wind noise will tend to be somewhat different at each mic, showing up as some incoherent measurements between the two, while turbine noise will be synched or similar in each mic (if the data shows perfect coherence between the two mics, you can be quite sure there is no wind noise contamination). Beyond the low-frequency data and suggestions presented by Hessler, this set of guidelines includes several general recommendations for non-low-frequency noise that are worth noting. Most strikingly, the guidelines suggest keeping average dBA sound levels to 40dB at homes, and urges site plans that include many homes in the 40-45dB range to be adusted to minimize the number of homes receiving more than 40dBA. They also stress that for locations with ambient levels over 35dB (which includes most rural locations during the day), it is important to keep turbine noise to no more than 5dB louder than ambient; this is in contrast to many locales where 10dB over ambient is allowed. Both of these recommendations are based on reported annoyance and complaints at existing wind farms; while not going “all the way” to a 30 or 35dBA limit as suggested by some, this downward shift from today’s norm of 45dB or more is notable. Extensive field experience measuring operational projects indicates that sound levels commonly fluctuate by roughly +/- 5 dBA about the mean trend line and that short-lived (10 to 20 minute) spikes on the order of 15 to 20 dBA above the mean are occasionally observed when atmospheric conditions strongly favor the generation and propagation of noise. Because no project can be designed so that all such spikes would remain below the 40 or 45 dBA targets at all times, these values are expressed as long-term mean levels, or the central trend through data collected over a period of several weeks. Indeed, they also present some compelling graphs showing actual noise levels as the wind speed increases, which show that there is typically a 20dBA range of noise level at any given wind speed; this represents both variation in how strong the wind and ambient rustling of grass and leaves is when hub-height wind is creating turbine noise, and the impacts of various atmospheric conditions that change the noise level at the turbine and sound propagation in the surrounding environment. Ed. note: While this seems logical, we should note that 5% of the time over the limit can translate into a chronic experience for neighbors, and may create significant impacts when added to an already potentially marginal regulatory limit of 45dB or even 40dB, where “over the limit” can mean 10dB or more over background ambient. Five percent of the time translates to 72 days with 6 hours of excessive noise (20% of days), or 219 days with 2 hours of excessive noise (60% of days). For this reason, I’d lean to seeing this acknowledgement of the impracticality of 100% absolute limit be seen as a reason to set a somewhat lower average limit. If the limit were 30-35dB, it may be that we could tolerate more “over-limit” time, up to 10% or more. The final take-away of note from Hessler’s assessment guidelines is the fact that Leq, or average sound levels, even at short 10-minute averaging times, is not appropriate for assessing existing background ambient noise levels or project sound levels; instead, Hessler stresses the use of the L90 level, representing the dB level that is exceeded 90% of the time, as more able to discern actual ambient levels and project noise levels (though again, he proposes long averaging times for the L90 noise criteria). As I was completing this summary of recent low-frequency noise reports, a new one was released; while actually written in late 2010, in December 2011 the Ontario Ministry of Environment released a literature review on low frequency noise and infrasound written by HGC Engineering, a noise consultancy. As usual, I urge you to check out the full report for more detail; the general tone and findings follows from most other similar overviews, concluding that while wind farms produce plenty of audible low-frequency noise, the infrasonic frequencies are below the levels necessary for human perception. At the same time, though, the report contains a number of details that, to my eye, reinforce many of the other reports here in justifying the raising of a cautionary yellow flag, rather than relaxing into assurance that there are no low-frequency and infrasound issues to be further explored. In particular, the literature references and recommendations dealing with low frequency sound inside homes, and the detailed references regarding wide individual variability in low frequency and infrasonic perceptual thresholds both bear close attention. The Ontario report stresses the need to assess indoor low frequency noise, since many complaints come from folks who are more bothered inside their homes than outside. The Ambrose/Rand study (above) provides some initial data that confirms this experience. 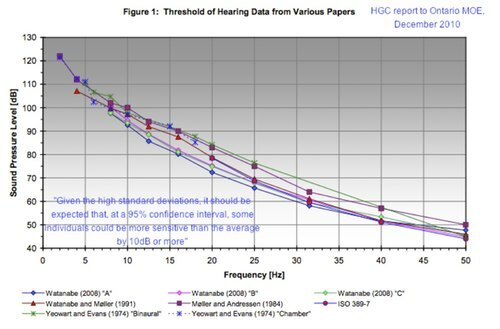 The HGC authors cite studies showing that transmission loss through walls is zero or near zero in low frequencies and infrasonic ranges (in contrast to the commonly assumed 15dB reduction in dBA full-spectrum sound). When combined with studies, also cited here, affirming just a 3dB reduction in lower frequencies with doubling of distance (rather than the 6dBA reduction presumed in most sound modeling, which focuses more on higher-frequency audible sound), the likelihood that neighbors at distances beyond 500m-1km may be experiencing elevated low-frequency sound in their homes becomes quite clearly understandable. Because of “the significant variation in sound impact from house to house as a function of room layout and sound transmission characteristics,” the HGC team recommends that MOE develop a protocol for assessing noise indoors. The report notes that best practices for indoor recording are still in development; it is challenging, since sound levels can vary by 20-30dB in different parts of a room (due to complex interactions of sound reflected from the walls, floor, and ceiling). One current best-practices approach is to average the sound of 4 points in the floor or ceiling corners of the room. A few things bear noticing here. These curves show hearing thresholds only at very low frequencies (below 50Hz), and are measured in unweighted dB (which is sometimes called dBL and sometimes dBZ, and sometimes, just dB). The authors note that some (few) individuals are expected to be more sensitive than these curves “by 10dB or more.” You can see the 95-100dBL thresholds at 10Hz, which dominate the dBG levels that result in the same threshold; remember here the Bray/James data showing dBG peaks of over 90dB, and more often, over 80dB. Remember that these curves are the average thresholds found in each of these 8 different studies, and that the studies use simple pure tones at each frequency, gradually increasing the volume/amplitude of the sound until the subject reports being able to hear it. Bearing this in mind, the HGC report has a good set of literature summaries that address the individual variability within each of these average curves. In sum, the HGC/Ontario report stresses that “it is clear that some caution is needed when judging the audibility of sound which approach the mean thresholds of hearing.” Yet they also concludes that, below 20Hz, “sound pressure levels produced by modern upwind turbines will be well below (on the order of 20dB below) the average threshold of hearing, at the setback distances typical in Ontario.” (setbacks are 550m/1800ft; bear in mind that beyond here, infrasound will drop by only 3dB per doubling distance, so that at 1.1km/3600ft, sound will be perhaps 23dB below the average thresholds). Ed. note: To my eye, given the individual variability noted in this report and the emerging study of peak, rather than average, infrasound and low-frequency noise levels, this relatively close gap between (average) infrasonic and (average) hearing thresholds does suggest that peak sounds could easily approach the average thresholds and be above some individuals’ thresholds. The HGC report also addresses the challenges of getting accurate low-frequency readings in windy conditions, as Hessler stresses. But rather than joining Hessler in considering low-frequency and infrasonic readings to be entirely unreliable or impossible around wind farms, HGC notes several approaches, including a NASA-designed wind screen and an in-ground system, both of which allow for accurate infrasonic readings, though they distort or miss higher frequencies. Indeed, while the HGC report concludes that infrasound is unlikely to be an issue, so need not be routinely measured as part of project permitting, they also note the ongoing investigations taking place by acousticians (as well as the public apprehension), and recommend that MOE adopt measurement procedures for infrasound, to be used in specific situations – presumably, when complaints arise, and perhaps also to provide for better comparison between studies that are performed in the coming years. A few things are worth noticing here. 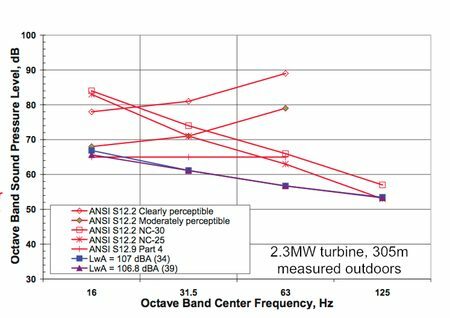 The dotted lines show the same hearing threshold curves we saw in the previous graph, with an International Standards Organization standard overlaid on them; the two other curves, marked with triangles, are actual measurements of wind farm noise. The first thing I noticed was that the two studies of wind farm noise plotted here show surprisingly little difference in overall sound levels between 305m/1000ft (Kamperman and James) and 650m/2100ft (HGC) – this may reflect differences in the local topography or turbine size, or could be a reminder that simple sound propagation models (which would suggest that the darker triangles from HGC should be routinely 3-6dB below the purple Kamperman/James data) are not as reliable as we might wish. We can expect, once again, these low-frequency sound levels to continue to drop only 3dB at 4200ft, and 6dB at 8400ft. 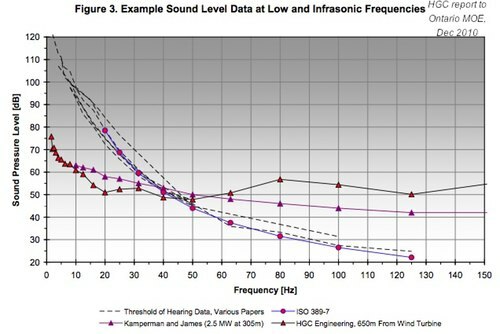 If we add to this graph the reminder noted by HGC of “strong, audible low frequency (but not infrasonic) tones from some turbines,” it once again comes into clear focus that the lower frequency parts of the wind turbine sound spectrum are likely to be key factors in triggering annoyance among neighbors. Ed. note: While some reports, including this one, tend to suggest that leaf rustling and wind in trees and ears will mask these lower frequencies (which are not that much above our hearing thresholds), the experiential reality in most situations is that the turbine noise remains clearly audible at a lower frequency than the wind and rustling sounds in vegetation; while the absolute dB levels may match or suggest that the turbines would be masked, the higher frequencies of the leaves do not in fact mask the generally lower overall frequency content of the turbines. Finally, I want to mention a brief summary included in the HGC report of a very interesting detailed study by Møller, CS Pedersen, and Persson-Waye, which investigated a randomly selected sample of 21 cases of low-frequency noise complaints from a pool of 203 cases (these were not wind farm noise locations; just homes where people reported a bothersome low frequency noise). The study involved making recordings of sound in the homes of the complainants, after which the subjects were exposed to the sounds in blind listening tests at a low-frequency test facility. The study concluded that some of the complainants were annoyed by physical sounds, and others were suffering from low frequency tinnitus. That is, this latter group did not hear or respond to the actual sounds recorded in their homes. The authors stressed that physical sounds in the infrasonic range were not found to be responsible for the annoyance in any of the cases, which means that the ones who did hear and respond to the sounds recorded in their home were in fact being bothered by low-frequency noise, rather than infrasound. Ed. note: of course, this is not evidence that no infrasound-related complaints are valid, especially if considering the new measurement methods being used by Bray/James. But we also must be cautious not to simply assume that the Bray/James work, or the Ambrose/Rand work (where the infrasound peaks were significantly lower than Bray/James) can be instantly and broadly applied to presume that any situation reporting no infrasound issue is inherently invalid, just because these new methods were not employed. Science moves slowly, to be sure, but it does move as evidence accumulates and is affirmed elsewhere. It’s important to note the newest studies, but there needs to be far more investigation, using similar methods in different situations, before these provocative new results could support widespread changes in policy or standards. While supporting the current Ontario MOE approach to wind farm noise assessment, which relies exclusively on dBA measurements, with penalties for tones, “which often occur in the low frequency range,” the HGC report stresses that “there is a degree of disagreement and uncertainty in the literature of some of the subjects discussed in this review, and research efforts are ongoing.” They recommend that any low-frequency or infrasound policies adopted by the province of Ontario should have some built-in flexibility, so as to incorporate new research findings in the future. Okay, almost there! Just three more, each much shorter summaries than those we’ve covered so far. Knopper and Olsen’s paper in Environmental Health, which is a literature review of health effects of wind turbines, affirms the conventional wisdom that the noise from wind farms is not loud enough to directly trigger physiological reactions. They do note that annoyance and sleep disturbance “have been statistically associated with wind turbine noise especially when found at sound pressure levels greater than 40 dB(A),” which lines up well with the emerging consensus we see in the mainstream papers here, encouraging project planners to limit exposures above that level at nearby residences. This annoyance and sleep disruption is also correlated with visual impact and attitudes to the local wind farm, as well as to general noise sensitivity. This literature review largely suggests that most of the annoyance reactions and health effects are caused indirectly, via anxiety or annoyance about the wind farm, citing a long history of studies of other community noise sources that show similar links between health effects and attitudes. One key point in this paper caught my attention: this idea that most health effects are due to various cognitive stresses means to the authors that “it appears that it is the change in the environment that is associated with reported health effects, not a turbine-specific variable like audible noise or infrasound.” What leapt out at me from this is that the change in the environment IS a “turbine-specific variable,” the wind farm itself! Even if the sound is not directly triggering health issues (noting that these reviews of previous literature do not include any recent work on short time-averaging and higher peak levels), what we are seeing is that for many people, their sense of place and home is of such importance that the arrival of a wind farm in their rural landscape triggers a strong negative response that encompasses aesthetic, stress, sleep, and quality of life issues. Acknowledging that the change in the environment is a substantial impact in and of itself is an important insight to bear in mind. A fascinating paper by Kroesen and Shreckenberg appeared in the Journal of the Acoustical Society of America in early 2011, which proposed a multi-faceted approach to understanding why noise can be annoying to people at their homes. This seems to be an important finding, for it is one of the more detailed investigations of the underlying factors in noise reactions; all too often, subjective factors such as anxiety, fear, and prior attitudes are assumed to be the primary drivers of negative reactions to wind farms, based either on assumptions or on simpler survey results. This study seems to point to more concrete experiences such as the noise itself being bothersome or intruding into valued activities as the core factors. With the exception of the Pedersen non-clan in Scandinavia, most of the best-known research and reports on wind farm noise have come from the US and Canada. But a lot of important work is ongoing in Australia and New Zealand as well, where several large wind farms have spurred widespread complaints at greater distances than we commonly hear about elsewhere (2-4km). Bob Thorns is one one of the acousticians there who has investigated wind farm noise in as much detail as anyone here; his Ph.D. thesis on perception and annoyance in response to moderate noise plowed some very fresh ground. This year, Thorne published a paper that addressed The Problems with “Noise Numbers” for Wind Farm Noise Assessment that introduced a new hypothesis worthy of serious followup study: the concept of heightened noise zones (HNZ) as a key driver of unexpectedly high levels of annoyance. the predicted values are given as a range, ±3 dB(A) at 1,000 meters for the most common prediction method with the predicted value being the “middle” of the range. The uncertainty increases with distance and the effect of two or more turbines operating in phase with a light/strong breeze blowing toward a residence. A variation of 6 to 7 dB(A) can be expected under such adverse conditions. Thus, on any given day the wind farm background LA95 or “source” time-average (LAeq) sound levels—assuming the wind farm is operating—could vary significantly in comparison with the predicted sound level. This is without the additional effect of any adverse wind effects or weather effects such as inversions. As noted by Hessler, when considering all such effects, peaks of up to 20dB over the predicted (modeled) levels can be expected. All of this leads Thorne to conclude that any compliance criteria based on a single value (including a low 35dBA Leq, a higher 40dBA L95, or an ambient-plus 5dB) are ineffective and “unacceptable” as protection from noise nuisance, because “current noise prediction models are simplistic, have a high degree of uncertainty, and do not make allowance for” the sorts of variables and effects reported above. This latter proposal dovetails nicely with an emerging “cautionary” consensus of trying to keep noise at non-participating neighbors homes to no more than 35dB. As AEI often emphasizes, such limits need not preclude development if they also include provisions to allow closer siting to neighbors who don’t mind hearing turbines more often or more noticeably. Phew! We made it. I appreciate your diligence in reading all this through, and hope you’ll agree that the details found in this wide-ranging set of papers add some important and helpful perspectives as we try to understand why wind farms are triggering more annoyance than most other community noise sources. While the possible role of infrasound in community responses remains highly contentious, I’m struck by the increasing acknowledgement of the importance of low frequency components of wind farm noise (especially inside homes), and the move toward lower (40dB) noise limits even among mainstream acousticians. It appears that the common U.S. regulatory standards of 45-50dB are no longer considered appropriate in many situations, especially because of the low frequency considerations. While many acousticians continue to recommend limits of 30-35dB to effectively eliminate noise complaints, I’m struck by how the gap between the mainstream and cautionary views is rapidly shrinking. This bodes well for a more positive dialogue on these subtle but important questions surrounding noise annoyance, quality of life, and wind farm siting guidelines. Even 40dB standards will require a new level of collaboration between wind developers and host communities – and in this lies the possibility of a gradual move toward what AEI sees as the obvious win-win path forward: adoption of lower noise limits (which will likely vary by community, based on the local sense of place and tolerance for moderate noise), in combination with negotiated easements allowing closer siting to homes where the residents don’t mind somewhat higher noise levels. Time will tell how siting policy will evolve, but it’s clear that the conventional wisdom is shifting. Ongoing research and more informed public debate are likely to keep the process of learning, listening, and experimenting very interesting in the next few years. Here’s to a constructive dialogue in 2012 and beyond! Given that “the gap between the mainstream and cautionary views is rapidly shrinking” (in other words, we objectors who listened to the neighbors were right) do you find the continuing installation of wind turbines at 40-45dbA levels (i.e. setbacks in the 300-500m range) troubling? At what point would you suggest a precautionary approach, and recommend a moratorium until we get this sorted out? Oh, and thanks for taking the time to put this together. Over the holidays, yet! It is the most complete review I’ve seen, and well written. There is no real evidence that windfarm noise really affects their neighbours. Any evidence is falsified by the fact that we have lived near shore for ages, and that the sound of waves pounding on the beach affects the neighbours of the beach. There is low frequency noise to be heard near shores, also infrasound. in the article – referred 35 dBA limit in sweden (quiet areas) is seldom used in practise, very few areas are planned as such in the regional planning. if they are not formally planned the government will use the 40 dBA limit instead. There are huge areas in sweden were people take the silent and natural soundscape for granted that are currently being exploited for wind industry applications. 1, it is not likely to anticipate severe effects from low frequency (LF) WT noise in the future – given that the outdoor values of 40 dBA and the Swedish Health department regulation values for LF levels indoor are met. 2, The annoyance from WT is not mainly due to LF noise, but from pulsating swisch noise that is higher in frequency / 500-1000 Hz. 3, Larger WT give more LF noise, but moderately so, about +1 dB (10-160 Hz) per doubling of the power rating. 4, LF sound is present from WT at dwellings, but not in a higher content than from other noise sources at their regulated levels, i e noise from traffic. the Bolin report also refers to a Lingren and Almgren report about sound insulation. This report has measurements made on a single very heavy wood facade with extraordinary high sound absorption in the room inside. This single (!) measurement can not be regarded as a general buildning type in Sweden (as stated in the Bolin et al report). Other measurements (DELTA 2007) on facades show much lower values for wooden facades. Using these values instead – the Swedish Health Department values indoor are likely to be surpassed in many cases – with just 5 WTs or more. You can not compare the continuos an periodic emissions from WTs to the stochastic emissions from natural elements. this is basic psychoacoustics. Remember, Possibly the same long time frequency spectra in these ceases, but NOT the same information to human perception – at all. This is overseen all the time, mostly by “acoustic experts” tha make long time frequency measurements and think they say everything about the perception/annoyance. Why is only Low Frequency Noise from Wind Farms talked about,I am effected I don’t have any wind farms. But I do have Industry,railway lines etc. There’s no doubt that wind turbines are getting more attention these days, as they are built in places that aren’t used to any serious road or industrial noise. Industry, airport, and railroad noise also have been well-studied over the years; low frequencies are especially considered in industrial noise sources. Yet always, there is some audible noise for some neighbors, and it sounds like you are more affected by it than perhaps some of your neighbors are. Sorry to hear that. AEI is a small operation, and so can’t compile information on all noise sources. You might see if Noise Pollution Clearinghouse, at nonoise.org , has information on older studies of industry and railroad noise.